As a tactic of obstruction, stonewalling depends for its effectiveness on the superior power of the obstructor. But the obstructed can prevail by outwitting the stonewaller, or by acquiring superior power, or by feigning superior power. To deal with stonewallers, the tactics you use depend on the tactics you face. 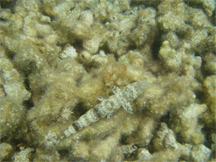 A lizardfish in a typical pose. Lizardfish, of which there are over 30 species, hunt prey mostly by ambush. They rest on the bottom, or sometimes bury themselves, lying in wait. This strategy is facilitated by the fish's shape and coloration, which is analogous to the "Voluminous Irrelevance" tactic favored by some organizational obstructionists. In voluminous irrelevance, the information you seek is buried in a mass of irrelevant information, just as the lizardfish hides itself in a mass of other life and sea bottom. More about lizardfish. Photo by Dr. Dwayne Meadows, NOAA/NMFS/OPR, (red oval superimposed by me), courtesy National Oceanic and Atmospheric Administration. Here are some stonewalling tactics based mostly on misrepresentation, with some suggestions for dealing with stonewallers. See "Stonewalling: II," Point Lookout for August 27, 2008, for tactics based on bureaucratic practices. Clarification requests from stonewallers can include demands for specificity, definitions of terms, resolution of alleged ambiguity, and an astounding array of other delaying tactics. Example: "When you say, 'show stopper,' exactly what level of unresolved defect are you asking about: 4, 5, or both 4 and 5?" These requests are especially frustrating when they're delivered near the deadline you set for a response. Recognize that these clarification requests aren't real. Anticipate: ask questions early and with such extreme specificity that any extended response times or late clarification requests will be obvious delaying tactics. Minimalist responses can be nearly content-free. Example: if you ask, "When do you think you can get me an answer?" the response can be, "As soon as we know." You were expecting a date or time, but the response describes a condition of availability. Phrase your question so as to proscribe content-free responses. Example: "Please tell me a date and time by which I'll have an answer." Worry not about sounding nit-picky; the stonewaller knows exactly what's happening, despite protestations or feigned hurts. In a tactic almost opposite to the minimalist response, the stonewaller provides long-winded, detailed, irrelevant responses. The bulk can be so great that you might find difficulty extracting the information you sought, and, in any case, it can take a long time to discover that the answer you seek isn't there. Specificity is the key. Detail exactly what you're seeking, and include a suggestion that the requested information is all you want for the moment, "to save you <the stonewaller> time." This tactic is used by stonewallers to assuage frustration by explaining that the stonewaller's delay is in the best interests of the obstructed. Example: "If I told you now, I couldn't be sure it was right, and you'd be proceeding on false information." It is as if the obstructor is playing the role of parent, saying, "It's for your own good." Don't be taken in, even if the stonewaller seems amiable, kindly, and concerned. Always remember that your welfare is very far down on the obstructor's list of priorities, and that you haven't requested — and don't need — parental protection. Repeat your request more urgently: "I'll take that risk. Tell me what you know. Now, please." Destructive as stonewallers can be, their tactics don't work well against stonewalling — it's hard to block the progress of someone who wants to stay put. Countering stonewallers requires creativity. For more about obstructionist tactics generally, see "Obstructionist Tactics: I," Point Lookout for July 23, 2008. Would you like to see your comments posted here? rbrenzooedaGNhmFhNgwUner@ChacPYggtpDHeRGgVGjHoCanyon.comSend me your comments by email, or by Web form. You just made a great suggestion at a meeting, and ended up with responsibility for implementing it. Not at all what you had in mind, but it's a trap you've fallen into before. How can you share your ideas without risk of getting even more work to do? As a consultant and coach I hear about what people hate about their jobs. Here's some of it. It might help you appreciate your job. I offer email and telephone coaching at both corporate and individual rates. Contact Rick for details at rbrenauXPJdUAlFSpQXlSner@ChacGAqTUiaGXIbWzAAMoCanyon.com or (650) 787-6475, or toll-free in the continental US at (866) 378-5470.